Ever since I was in kindergarten, I wanted to be a teacher. The stumbling block in my way was that to be a teacher I had to attend college. I grew up in a rural community and, while my sister had gone to college, neither of my parents did and the thought still frightened me. As a first generation college student, I didn’t know how the process worked, what to expect or what I would do if I couldn’t go to college to be a teacher. I visited Walsh my junior year for Junior Achievement Day, and as I walked around I began to picture myself here. When the time came to apply, I only applied to Walsh. I was accepted and really excited, but still nervous about going to college. My mom sat me down and reminded me of the dream I have had since I was a little girl of being a teacher. She encouraged me to try it out for a year and if I decided after that it wasn’t for me, then we would figure something else out together. My admissions counselor often reached out to me to see if there was anything that he could do to help. My parents had a lot of questions about where they were sending their daughter, what college would be like, and Walsh was very accessible to them to answer their questions as well and understand the process. We were incredibly grateful for all of the help we got in making the transition smooth. When I arrived on campus, the RAs and Peacemakers helped me to meet people and make friends and get involved. I began my classes, excited that I was able to get into the classroom right away and begin learning about my future profession. I came into college as an Early Childhood Education major, and began observing in elementary school classrooms. While I loved teaching with the young kids, playing educational games and doing fun crafts, I felt like something wasn’t right. I started to get really overwhelmed and begin to question if college was really for me again. I sent my professor a frantic email late one night, and to my surprise she responded back only a few minutes later. I realized how much my professors valued me, and in turn every other student. She suggested that I try shadowing in different classrooms rather than elementary school. I went to a middle school classroom and realized how much I enjoyed the middle school kids. They were funny and witty and much more my speed. At the end of my freshman year I officially made the switch to middle childhood and decided to continue to pursue my dream of becoming a teacher. Since being at Walsh I have had so many opportunities to try new activities. I set a goal for myself awhile back to try at least one new thing a year, and my sophomore year of college I joined Science Club. Every club on campus encourages students of all majors to get involved and attend their meetings. I had a few friends in the club, so I figured I would try! This year I joined Pre-Engineering Club which was even further outside of my comfort zone. It has helped me to meet new friends, while also learning a little about other subjects that my future students might be interested in. 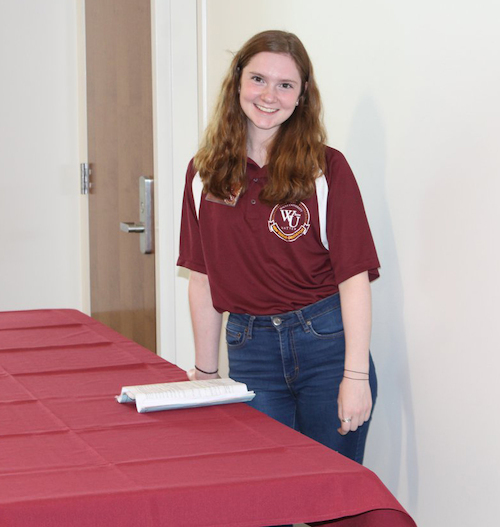 When I came to Walsh everyone talked about Global Learning and the amazing opportunities that were abroad, but I was perfectly content in staying on campus. This year when the President’s Pilgrimage was announced, a few of my friends began talking about going, but I had already deleted the email with the information because I did not think it would be possible. I had never been out of the country, or even been on an airplane. I emailed Mike Cinson, the Director of Global Learning, and asked for more information. After learning more, I decided that the trip was perfect for me. It was a faith-based trip, I would be traveling with a group, there were great fundraising opportunities, and I signed up. I am so looking forward to going on this pilgrimage with my friends and grow in my faith. I am excited for what the rest of my Walsh experience will bring. I have loved being in the classroom more and beginning to impact the students I am working with. I know that if I am ever having questions, I can reach out to anyone on campus and they will get back to me with answers or point me in the right direction as soon as possible. I am so thankful for all of the help I was given throughout my college journey and I know Walsh will continue to be a big part of my future even after I graduate.